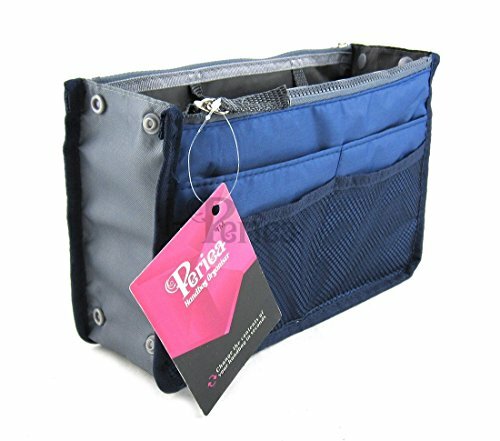 Handbag Organizer Insert - A Purse Organizer that Works! My purse started to get heavy and hurt my shoulder. I didn't realize actually just how much junk I was carrying around in my handbag until one day I decided to literally dump it on the table (something we all should do once in a while) You think adding some lipstick, or a new brush, or lots of change and phone accessories couldn't possibly weight that much... but they do!! Organizing your purse is one way to feel in control and know EXACTLY what is inside of it at all times. These handbag organizer inserts come in many sizes, and are the quickest way to find anything in your purse. They are a affordable and make life so much easier! You can get these in different sizes depending on the size of your purse. But basically you can simply put everything in it and then pull the insert out if you need to search but I found just opening your purse and looking inside you can see everything you need right away. These are a really cool idea instead of searching all the corners of your handbag. As you can see by the picture above there is a place for everything. You can get these in different sizes. 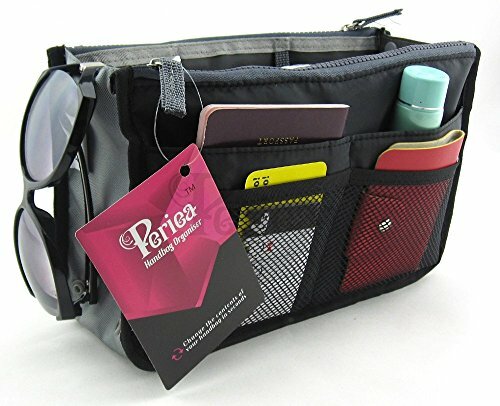 The periea line carries a small one that is 5.5 x 8.5 inches, so if you have a smaller purse this would work. This can take the place of your wallet or hold your wallet in the center. It is always the smaller things that I lose track of. By having their very own pocket they don't become broken. This one comes in different sizes and colors with loads of great reviews. You can simply fit this right into your purse and never take it out. 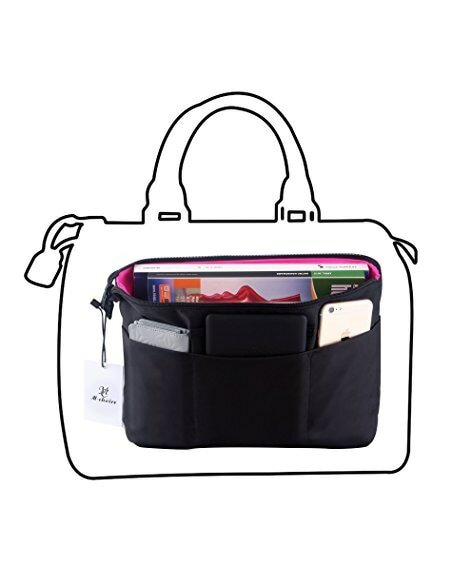 Most purses or handbags only have a couple of zippered pockets, whereas this has 12 compartments, you can simply fit it right in and it becomes the main body of your purse or handbag. This will keep things safe and secure. 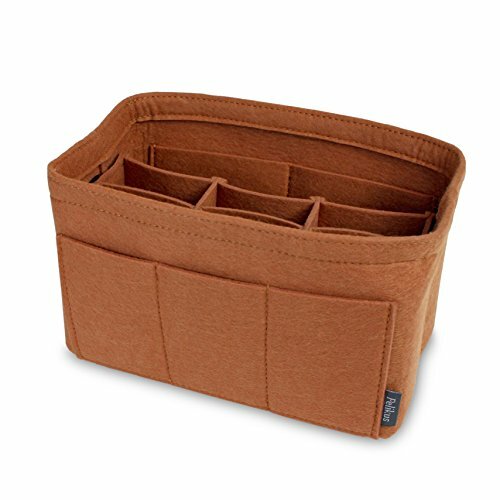 Fit this felt handbag organizer insert right into your bag and you have numerous separated compartments to stop things from rolling around together as they tend to do in the bottom of a handbag. 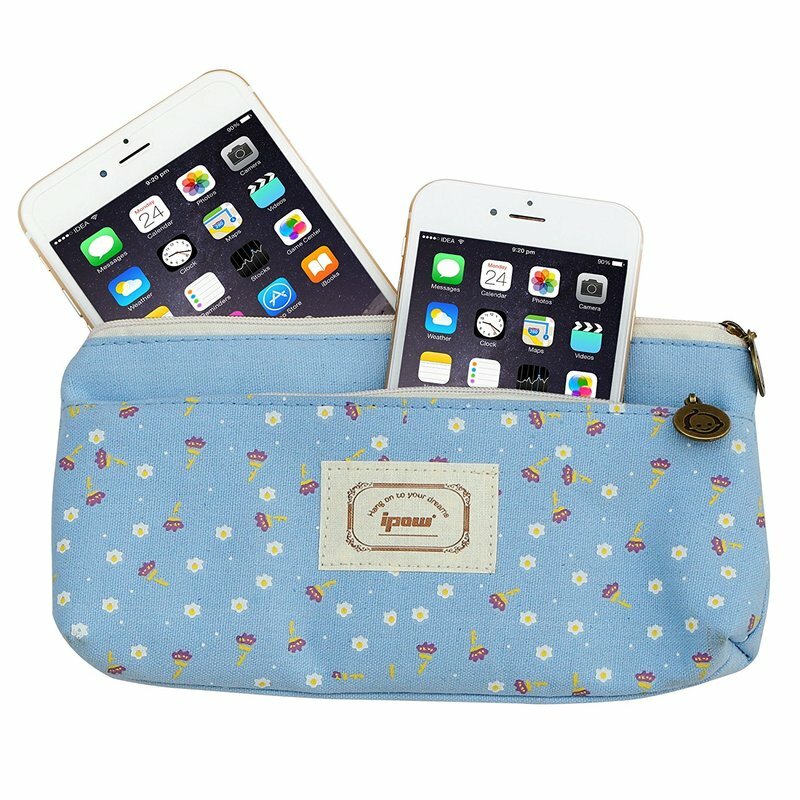 If you want something a little smaller that is more portable, this cute little bag will keep your electronics safe and any other items you don't want to go searching for in your purse or handbag. Not only can you now organize the insides of your purse, but you can also organize the different ones you own. You simply slide the purse or handbag through the sides of these clear plastic pockets and hang in your closet. Make this year the year you get organized. It is amazing just how good you feel when you organize something such as your purse. Step Two - Dump - Yes literally dump your purse onto the towel. Step Three - Separate - Separate the most obvious important items such as your wallet, keys, makeup etc. Step Four - Garbage - Pick out the bits of paper, store receipts you don't need, old appointment cards, old business cards, all the things you simply shoved in there to look at one day. Step Five - Handbag Insert or Similar - Purchase an insert as above examples or use a small makeup bag or container to house small items you don't want to lose track of such as your electronics, spare keys, makeup etc. If you are lucky enough to own a purse with lots of compartments, you may not need an insert. Step Six - Organize - Put everything back in your purse. It will amaze you just how much better you will feel when you open your purse and know where everything is. You may even have a winning lottery ticket in the abyss of the handbag you didn't know you had! IF you are in organizing mode for your home, car and yard, then take the extra step and get your handbag or purse organized. It is amazing just how much dead weight we carry around with us on a daily basis! Once you have dumped out your purse contents and are putting the things you need back in, check your wallet for excess change. This is where you purse can end up weighing so much! In Canada we have larger coins that replaced the one and two dollar bills, so they tend to weigh down the wallet which of course is in the purse. A forced savings plan would be to get into the habit of putting some extra change in a piggy bank just for you! Get rid of excess garbage, and anything that weighs you down and also makes it hard to find the things you need. Walk lighter and simply feel more organized. Unless you do this all the time, you will be amazed at just what junk accumulates in your purse or just what gets broken. Electronics always tend to suffer with scratches, especially the cell phone rubbing up against keys. These organizers are an affordable way to protect things that are important enough for you that you carry them with you in your purse.